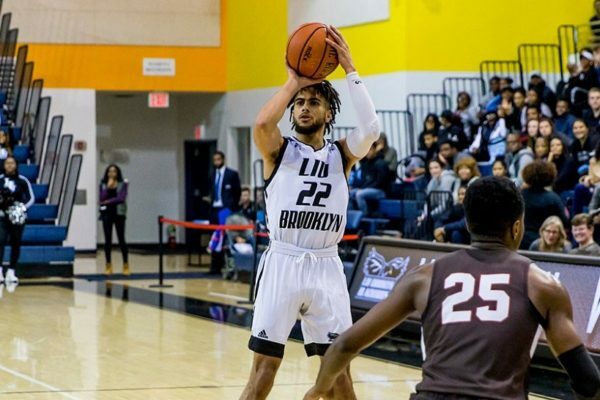 QUEENS, N.Y. – The second year of the Chris Mullin era got off to a spectacular start on Friday night, as the Red Storm downed Bethune-Cookman, 100-53, at Carnesecca Arena. 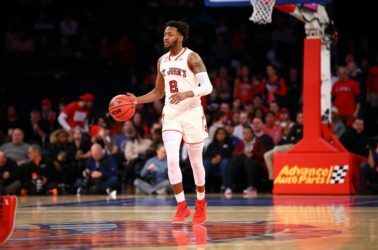 The Johnnies put forth an incredibly efficient effort on the offensive end, converting on 62.3 percent of their shots (33-of-53), the team’s highest total since the Red Storm sank 66.1 percent of its chances against Fordham on Dec. 7, 2013. St. John’s assisted on 21 of its 33 made baskets against the Wildcats, the team’s highest assist total in a single game since the Red Storm’s upset of Syracuse last year at Madison Square Garden on Dec. 13 when the Johnnies dished out 22. The team’s 100-point effort marked the highest-scoring season debut for the program since 1998-99, when the Red Storm downed UNC Asheville, 105-50, to kick off a campaign that saw the Red Storm reach the Elite Eight. With the win, the Red Storm extended its unbeaten streak in home-openers at Carnesecca Arena to 13, dating back to the 2004-2005 season. Federico Mussini led the Red Storm with 20 points, making five of his six shots from beyond the arc and sinking five free throws in just 18 minutes of action. The sophomore guard from Italy has shown a knack for season openers in his St. John’s career, having scored 18 points in his Carnesecca debut last year against Wagner. With 19 points on 5-of-7 shooting, including a 3-of-5 showing from downtown, Marcus LoVett registered the highest point total for a Red Storm player in his St. John’s debut since Nurideen Lindsey tallied 19 on Nov. 7, 2011 in a 74-59 victory over William & Mary. Two other members of the Red Storm reached double figures, as Yankuba Sima and Malik Ellison each added 11 points. Both players were very efficient from the floor, as Sima made all four of his shot attempts, while Ellison converted on five of his six chances from the floor. Tariq Owens impressed in his Red Storm debut, registering nine points, five blocks and four rebounds in just 13 minutes on the floor. Leading by 16 at the intermission, the Red Storm unleashed a 16-0 run to start the second half to put the contest out of reach. The Johnnies’ lead did not dip below 30 points in the final 15 minutes of the contest. 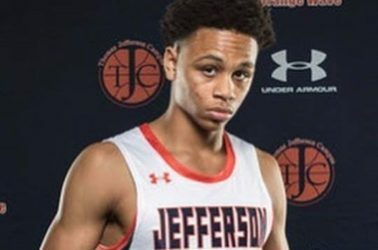 The Wildcats got off to a hot start from the floor, draining two of their first three tries from deep and taking an early 6-2 lead less than 90 seconds into the game. The Red Storm battled back to quickly tie the contest at six, but Bethune-Cookman drained yet another three to move ahead, 9-6, at the game’s first media timeout. After the stoppage, the Red Storm rattled off a 12-2 run, highlighted by seven points from Mussini. 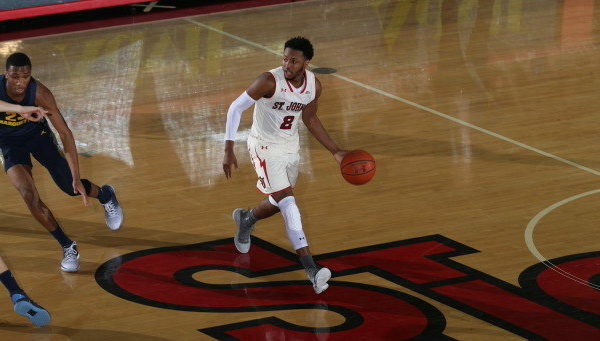 Shamorie Ponds, who finished his Red Storm debut with eight points, three assists and no turnovers, capped the streak with his first collegiate three-pointer. Bethune-Cookman scored four in a row to cut the deficit to three, 18-15, with 10:38 left in the half, but the Red Storm responded with another run, this time a 9-2 tear to expand its lead to 10, 27-17, with seven minutes left until the intermission. 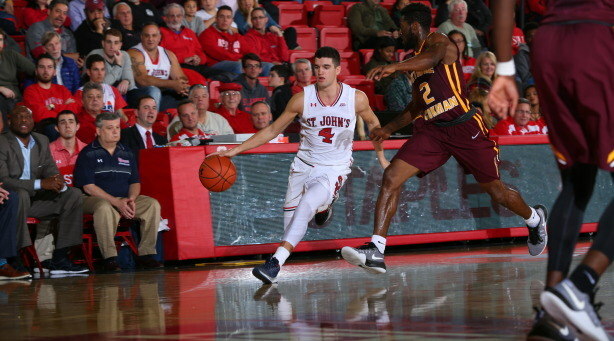 The Red Storm continued to apply pressure over the closing minutes of the period, as LoVett poured in eight-straight points for the Johnnies to extend their lead to 14, 39-25, with 2:43 to play. LoVett added a step-back triple in the final seconds of the period and the Johnnies entered the locker room with a 16-point lead, 47-31. The Red Storm scored the first 16 points of the second half, seven of which came from Owens. 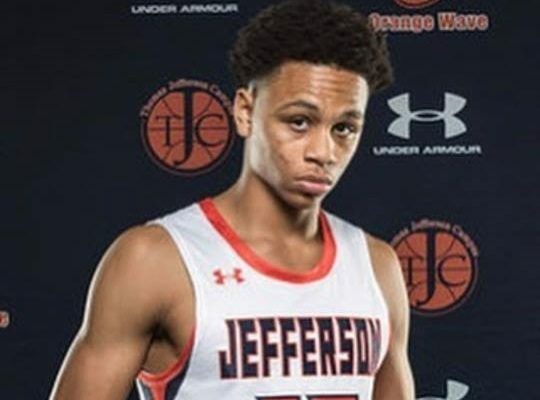 The redshirt sophomore threw down a pair of thunderous dunks, the first of which was an and-one, and drained a baseline jumper during the sequence. Bethune-Cookman did not register a second-half field goal until more than five minutes had passed in the stanza.